This photo belongs to my trip in Daykudni, in winter 2008. I don't remember where exactly this place is but it was a deep valley adjacent to Ashtarlai district. 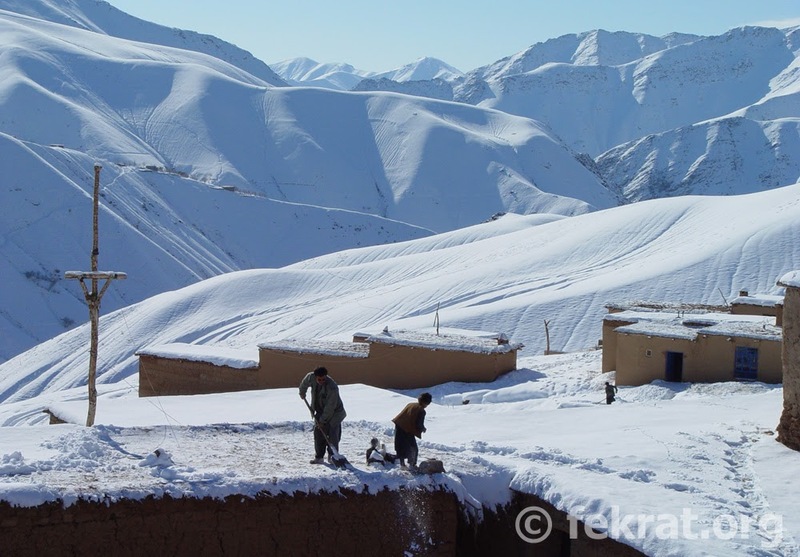 In the winter of 2008, I with a friend - who was a documentary filmmaker - made a trip to central part of Afghanistan "Hazarajat" (where the Hazaras are living). Two days before, a storm of heavy snow hit the area and there was over a foot and half of snow blanked in all places. My friend and I were sluggishly ascending the steep and slippery path to top of the pass, near Ashtarlai district. In a short distance, a group of men appeared who were zigzagging their way up to the mountain. My friend and I were probably the second group making the narrow trench wider in the snow, and perhaps easier for the next travelers. We gradually approached the travelers who were piercing into the depth of the snow and were step by step nearing. We stepped aside and patiently waited to let them pass. At a converging point, I looked at the men’s face; they looked drained, anguished, worried and irritable. In the middle, a man who was going short in breathing carried a basket in his back; one of those baskets that are usually used for collecting grasses for animals in the summer. Suddenly, I heard groans of a woman from the basket, she sounded like a wounded soldier, even close to sounds of someone who gives out the last breath. A sudden fear with grief conquered me. I impatiently asked the last person in the row: “Who is in the basket and what is going on?” The pale man who has already seemed grief-stricken was one of the woman's closest family members paused for a few seconds to catch his breath, then, he said: “She is sick, we are taking her to the doctor, in Nili." They were coming from Ashtarlai district. He told me that they were en route for two days and they were in their third day to arrive at the hospital in Nili, the capital of Daykundi province. Six years passed from that winter and that incident, I am having doubt that there has been much improvement in Daykudi; one of the poorest provinces in the far-flung of central Afghanistan. This memory is one of the many that I recall now from my trip to Daikuni province, in one the coldest winters, in 2008.